Venturing outside of a niche can be the right decision to make. During the conversation they covered some of their own experiences and the founding stories of Twitter and Slack to outline how there can be benefits to looking outside your niche. - Your niche is limiting your growth potential in painful way. - Your niche is at risk of being fundamentally altered by a shift in the market beyond your control. - Your product has a customer base submitting feature requests that overwhelming indicate you should build something outside of your niche. - Your team is bored with solving the challenges of your current niche. - Your niche creates seasonal revenue spikes that are tough to manage. - Your niche is being better served by a bigger, faster, stronger competitor. The best takeaway from this episode is, beware of mirages. Really really prove it to yourself before you make the big decision to leave a niche. Use data, get feedback from your team, talk to advisors. Do the work to prove to yourself that the effort to go outside of your niche is worth it. 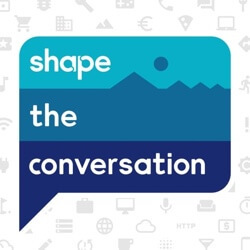 And this is our podcast "Shape the Conversation". Nicole and I work together here with a great team that Shape.io headquartered in Bend Oregon. Some background about us. We left our agency jobs as marketers to build software for digital advertising teams. We'll be talking about working in marketing and growing Shape.io on this podcast. Why should you listen to us at all? Well Shape, we have been able to turn into a profitable software company. There are seven of us now that work here at Shape so the team's been growing. We've seen it kind of from the bootstrap side and from the venture capital side we raised funding in 2015 and when you use that money to kind of grow the team and customers sense then like I said we're headquartered in Bend Oregon so that's a little bit unique for a software company outside of the Silicon Valley bubble. Then on this podcast we just like to try to give you something to think about through your week as you go about your own conversations and building your own projects and teams. So Nicole what are we talking about this week? So, on this week's episode you often hear from a lot of business articles and a lot of business leaders that you, when starting a business, should have a very focused niche. We're going to be talking about you know kind of what are the signs when you can grow either successfully out of your niche or you know conversely let's say your business is having problems when do you decide to venture out of your niche? Yeah, I like this one because it's a little counter to like you said a lot of the advice out there you'll find your niche, "riches in niches." And I think that can be the case but it's interesting like you said, explore when can you maybe jump outside that niche? Are there some parameters or good examples of companies in the past that have said, "all right we're going to leave behind what we know really well" or "we're going to do what we really know really well and also do this other thing." And as I thought about this topic and went along I think important thing to remember is that there are consequences for going outside your niche. Some of them good some of them bad but like anything there's always a push and pull. Absolutely. So we'll be talking you know six-seven ideas about why we think you should move outside of your niche as well as examples and we're a great example of that too. So we'll kind of talk about our experience a little bit. Yeah we've definitely struggled with this how from our product development and we build a software product for digital marketers. There's lots of things that go on being a digital marketer today. How do you decide what problems to take on? How do you decide what problems not to take on? Do you stay just in the market of selling to digital marketers? Should you try to venture out to offer some kind of product to people who that aren't as technically savvy with marketing more of a broader product to anybody that wants to do marketing for their own business? So I think we, like every business and even you personally are looking at your career as your own little mini business, you'll struggle to thinking about do I stay in my niche, do I just kind of keep doing what I'm really good at and maximize that or should, even with my career, maybe branch outside my niche to explore some of the upside or even just challenge myself. So I think the best reason to probably leave your niche is the first one we have here. The first idea we have. Yeah so the idea is limited growth you know basically your business has reached a point where maybe it's successful maybe you know you haven't quite reached where your goals are but you really don't have the opportunity to expand with your current market or your current audience. One of the great examples that we kind of think of with this is really Starbucks. So for those of you that don't know the history of Starbucks, before being handed basically to Howard Schultz to make it into what it is today, they sold coffee beans and they sold espresso machines and that was kind of their niche and it was only when they decided to branch out and start selling that coffee experience in the coffee houses that they really saw the exponential growth. Now they may not have topped out yet in the espresso machine business in the 1970s but they were gonna get there. And so I mean the growth curve is just absolutely insane from Starbucks once they pivoted. Yeah. And I think that's a perfect example of your vision maybe being bigger than what your initial business is. So I think niches are a great way to get going and kind of get some traction some kind of business off the ground. Facebook focused on just colleges they worked out a lot of kinks they worked on a lot of the rough edges of the platform. They saw a lot of the bugs and this little bit of a safer environment with college kids earlier adopters. But Zuckerberg vision slowly became a lot bigger and he needed to move outside of that eventually to kind of fuel the vision he's fed his team. So I think that there are people that always plan on leaving their niche and don't struggle with it as much. No I was just going to say I think that's a great lead in to our next kind of example too which is a shift to the market or a future shift of the market. Zuckerberg being as smart as he is I have to imagine that he saw kind of this massive shift that was about to occur in the market. I don't know, maybe not but I would assume so. And so he made that decision to really, as you mentioned, kind of jump away specifically from colleges and create this multinational, billion user, communication paltform. Yeah. So the idea here what we're saying is OK you're in a market now or you're offering your product or service right now and you definitely see it not being the same viable market 10 years from now. Maybe a little bit more of a baseline example would be like, say you had a typewriter company in like the 70s and 80s and you were able to see maybe the future you know becoming more word processing and computers you might want to adjust your company vision if you really think that it's going that direction. I'm not sure how successful you would have been back in those days like doubling down on typewriters and staying in your niche. And even with typewriters have a great example of trying to you know look beyond your niche and your current niche with your company vision. You know if they had thought more about "hey we're a way for people to get ideas from their head onto paper" and they made theirselves a company trying to do that as opposed to "Hey we make the typewriters" then your company is better positioned long term and I think this is a really tough struggle for a lot of business owners or department heads or people that are looking to set vision like how do you have a big broad enough vision that's inspiring but also like have it apply to a niche you can actually service and be successful with. But I think what we're saying is, if there's some big obvious huge shift coming, think about getting outside of that niche before it's too late. Yeah, don't be left behind. Yeah. OK so let's say you have found yourself in a pretty reliable niche. Not much is changing. You feel like your customer base is doing well and now you're getting all this feedback from your customers. And I think that's another thing that can really pull you out of your niche is listening to customers and thinking about that. Yeah absolutely. I mean I think you know we're a great example that we face that on a daily basis where our customers are asking us you know "do you have reporting features" or "do you have this feature" and we have to constantly make that balance between like does this still fit our idea of budget management platform or do we need to, not necessarily pivot, but consider broadening outside of our niche. I'll let Jon talk about the history of really how Shape came to be because I think that's a great example of us expanding and then I think we can kind of flow back into how we made that decision and what we needed from our customers to actually be able to make that jump and feel comfortable about it. Yeah. So we weren't always Shape for a while our name was Steadybudget because we were really focused on solving budgeting problems for our customers. And that's an example of us trying to really hone in on a niche to get off the ground. The great thing about niches are they give you a lot clearer marketing stories that give you a lot clearer sales stories when you're going down that pipeline. So we wanted to tell this really like clean story around budgeting so we even put it in the name. Fast forward two years later we build some more features. They all don't necessarily focus on budgeting and yet when people think about our tool it's just plain budgeting tool and that's why we made the move to Shape is because it was a little bit more all encompassing a little bit more broad and that was really because we were pushed to build those new features by our customers like they were asking us to be a little bit more than just a pure budget management platform in some cases they wanted the collaboration features to be able to invite teammates to leave notes some of these things and we got pulled out of our niche core focus a little bit in that case and honestly we saw conversion rates drop on the website a little bit because now with Shape we had a little bit more of a broader story it's like "Hey we're a digital marketing platform" and people weren't as clear about what we do right away. Since then we obviously kept the name but adjusted to that copy to talk about budgeting and because that's still a lot the core of what our customers do. But we have built things that our customers have asked us to build and that the market seems kind of pulling us and we have some ways though that we think about that when we're taking that feedback. We just don't hear it from one person. Say like, I go right to the developers and say, "Hey, we need to build this right tomorrow!" And you know I don't think you can I think one of the things that you hear about in product management a lot is how you have to uncover the need behind the Ask for customers because if you take them at their word you're going to develop a, not always, but your typically going to develop something that's clunky and doesn't actually address the need. It's kind of like you know the peripheral, or not peripheral, but like a kind of a top level cure for the symptom. I don't know. Now I'm just wondering but so just to kind of refocus back. But one of the things that we do is we make sure that we have you know five-ten X of those asks before we really sit down and scope out the product feature that we want to expand especially if it's something that is very outside of our niche or the focus of budgeting. 5-10X we define that as, okay if only 10 percent of the people that tell us they're going to use this new feature use it, it's still worth it for us to build. You know, we don't look at it like oh 30 percent of our customer base is really requests and this one thing we should definitely build that because what we've found is that product adoption is never 100 percent. It's always some version of, "We kind of use it now" or "we love it now it's our newest feature" we're like "yeah it's good but I kind of wish it did this." So not everybody is going to use it every day. And in order to get it on your roadmap and put your development team on it or you know to put your team's energy into building whatever product or service you do you've got to make sure like a considerable amount of your current customers are going to be using this new thing unless you probably should be putting your time on what got them there in the first place. And then you have to harass them, not harass them, but you have to remind them over and over again that that feature exists. It's funny even with some of our current customers we announce something they're super excited and then like two-three months later they're like wait does it do this again? Yes, yes it does. Great question. Let me show you this fancy feature over here. Yeah and we've kind of touched on this in other episodes too like you're just one part of somebody's day you know launching this new feature working on the blog post of it you've spent two-three-four weeks on getting it together making sure every words dialed your art looks great everything is on there. It's just one more blog post somebody is reading that day and everybody uses software throughout their day. You don't see some kind of like cool new feature announced and then like "Oh you know what my calendar is just wide open for the next three hours to just really dig in there and learn everything about this new feature." No it's more like "Let me bookmark that and go remind me to go back later. I got to dig in to figure out what it does." It's like you're going to have to continue to also earn people using whatever new things you build that kind of go outside of that niche because they're not going to immediately associate you with this new feature, this new thing that hasn't been what you've been doing all along so you've got to be careful because that takes even more effort on marketing than using the momentum already have doing something new can take a lot of resources because you're trying to figure it out for the first time. But that can also be a reason to go outside your niche you know trying new stuff because one of the other reasons we have here to kind of like explore a new niche is to present new challenges to your team. And if you're doing the same thing every day, I was just thinking of an example like, say you're a bakery and all you make is this one kind of bagel, you know, an extreme example. It might be tough to hang on to the best employees if you're not giving them a little freedom to experiment with something else at least a different type of bagel you know you can be a little bit too militant, I think, on staying within your niche sometimes at the harm to not letting your employees or your team kind of explore a little bit more what might be out there. Yeah. Not only does that kind of reinvigorate your team members given new tasks and responsibilities. But I think it also reinvigorate your customer base a little bit. I think that's something that... I know this is mostly focusing on the team members side, but you know like you said if you just get that one type of bagel maybe they do a really really well forever and ever but you know try a little variation and who knows you might attract a new audience. you weren't expecting. Yeah and I think that's one of the really good reasons to continue to kind of push an experiment a little bit because if you aren't experimenting or at least trying some of these other things you're never going to get that upside. You know you're always going to be kind of back to our initial point sort of limited in your box in where you're at right now. I think definitely In tech walking that line of being really militant with your product or your app or whatever it is and keeping it really simple while also giving your developers, engineering team, and your current team enough interesting stuff to chew on is a really hard balance. You know Google always had kind of the 80/20 rule which is a little bit of their cop out way of doing it sort of like OK 20 percent a day just kind of like work on whatever you want. But I've always been more interested in how do we kind of integrate into the core mission of the company and be like 100 percent of your day. And how do you kind of balance those things. How do you get them to align and if you're so tied into your niche you're not even willing to explore then you might lose some people along the way but it might be what you have to do for the good of the overall company and the whole. So it's tough to say what to do in all those scenarios unless you are the one presented with it and all the information. So like motivation could be one reason to move into a different niche and give me your team something new to work on. But your hand might be a little bit more forced too to go outside of your niche. You might not have the luxury of exploring a niche you might have a real necessity to explore a new way of making money or new revenue streams. One example I thought of with this specific was a buddy of mine works for a company that has a popsicle location. So they're called Steel City Pops they've got all these really fancy popsicles they sell through all the summer time in the southeast Alabama Texas it's really hot and their sales are killing it in the summer time. My buddy is the accountant so he's really into the books, and then wintertime sales kind of slowed but in wintertime you still have to pay rent. So they really knew how to make popsicles well but they were kind of forced to diversify a little bit of their menu items work in some hot chocolate do some popsicles that are a little bit more traditional like winter flavors as opposed to summer flavors like pumpkin pie type stuff and those sort of things to try to draw people there during the winter. Now it's like new challenges for their employees, new menu items to add, new variables which is always a risk like we are talking about but I think it can be a necessity sometimes. And it sounds like in this case it's paid off for them. Yeah it's flattened out. Their revenues are a little bit more consistent. I think sometimes staying too small in your niche it can be risky and you need to diversify. Everyone says a healthy portfolio or retirement savings is diversified over a few things. I think the same thing can apply to your business. You know I think you can really hone in on a niche and I think a lot of companies have made great gains on exploiting a niche and mining and niche for everything that it's worth. But if something does happen to that niche there's a lot of examples where companies go under. In our industries specifically think if maybe all you did was focus on say Facebook ads or LinkedIn ads and there's a lot of companies out there that do, if there is some fundamental change that affects that platform that for some reason puts it in jeopardy, I don't see any out there, but you haven't built the skill set over the years to like adapt to that new channel. But I think taking that calculated risk does benefit the people that stay in the niche. Absolutely. And I think as long as you remain diligent if you remain able to pivot really quickly. In that case because like you said there are a lot of successful companies that do just Facebook or just LinkedIn advertising. So that again that kind of speaks to your niche as your career or you being an expert in your field. The great thing is I think marketers have a great skill set that apply across the board. So it's not necessarily as painful to pick up a new marketing area as it is to... I don't know switch from you know anesthesiology to... an advanced medical field. Yeah. I think if you have an advanced medical degree you've chosen your niche years ago and you're in it. All 20 years of schooling or whatever it is. Yeah but I think in terms of making pivots that kind of hits on our last point here and what we talked about, me and you have talked about too like legendary pivots when we kind of talked about this one but it's the example of you're in your niche you're looking around and you just realize the competition it's better, stronger, faster, building better products than you can their customers are happier than your customers and you just kind of see the writing on the wall. That's another time when OK let's explore a new niche and that can be a scary position to be in but I think there are a couple of examples of people have stared down that abyss and come out the other side. Absolutely. I think you've got two good examples if you want to jump into those. One story I've always been obsessed with and you've heard me tell like who knows how many times is how Twitter got founded because I find it fascinating and interesting to tie into with podcasts. So Ev Williams legendary tech founder. He basically, as far as I know, he might have invented the word blog if I remember off the top but he found a blogger back in the 90s sold it to Google for a bunch of money. He worked for Google for a year or two. Then he used that money to kind of found a company that was working on kind of a podcast technology for networks back in 03, 04, 05, 06. It's interesting that time period because it was really before the mobile phone. Like smartphones were able to play podcasts. So they, through 04-05 had a lot of trouble getting traction because the market wasn't there yet with the smartphone. Then in 07 Apple announces their iPhone and that they're going to you know have podcast app on there on iTunes. And Ev Williams thinks, "All right we're done. You know Apple's entered the space that it is bigger, stronger, faster." He looks at his books. He's got a few million dollars left of his venture capital that he had raised. And he looks around his team is like, "Hey, anybody that wants to keep showing up to work, split off into teams and just start coming up with ideas." So a bunch of groups of teams just kind of split off some people are like "alright I think I'll move on to the next company. Have fun guys just tooling around." and after a couple of weeks Ev Williams goes around to the teams and like what are you guys working on. So he goes over to one team and they're like "We've got this code that Jack has been working on, one of the guys in the group, for years and it just it lets you through SMS and text message kind of send an update to a bunch of people and post it up on a URL." and they're like, "Okay, that sounds interesting so why don't you guys build it out." So they take another couple of weeks they build it out and they presented again and Ev was like, "All right let me see how it works." and shows them, send texts, and says "OK what's the name. What do you think you're calling it?" and they say, "We're thinking about Twitter." And so they put it around. People are kind of updating where they're going to lunch, they're going to the park, it seems a little silly but then they start to see a little bit more of the implications that it's essentially the microblog. Ev built the technology that enabled web blogs across the Internet. This is essentially that but on a smaller scale and the light bulb goes off and then the whole team begins working on building out Twitter and it becomes one of the most quintessential tech companies of this decade. It all came out of the fact that people looked around their company they looked the niche they were trying to serve. They had no chance so they just completely jumped outside of it and tried something new and used the skills that they built. So that's should give some people at least some hope if you feel like you're sitting in your niche or you're standing around like It could be a profitable niche but I can't compete. I just something is keeping me from being able to really enter that market try something completely new. If you do have a team around you try to be honest about the situation you're in and galvanize the team to come up with ideas around you because who knows what might be just sitting there for the rest of the team to kind of move on in and work with that's better than what you're working on today. Absolutely, and that kind of leads into our next example which I'll try to keep pretty short here but Slack essentially, if you know the history, they started off is an online game basically what's called Glitch. And from the way that Jon has told me the story, I did not do the extensive research here. They were running out of cash essentially they were had you know a period of runway and then they were going to go out of business and so they looked internally and they said what do you want to do and as part of that kind of platform they really learned how to gameify some boring ish processes but also they built a communication platform that they felt like they could invest more time in and if you know anything about Slack or you use Slack it's just become this crazy popular behemoth of a communication platform for enterprises for businesses. I think my husband even uses it for some networking. I mean it's applied to so much I could see you know being a soccer mom and having a Slack channel for that there's like 15 Slack channels that you're running at any time. So it's really broadened its niche to the point where it was completely different than the gaming area. And look what it's done. Yeah anoter great example of pivot and then Slack is interesting too even thinking about niche because they are like the ultimate broad product. Every company essentially that uses email, you could make an argument that you could use Slack also to eliminate some of that e-mail. So I think that that's the ultimate broad play but when Slack got started they didn't tell that broad story right away. They didn't try to market to every company in the U.S. saying you should try this. They went to like early adopting tech companies saying like how this could help your tech company. Here's our API. You know they kind of leaned into techies at least that niche to start built out a lot of the initial tech, same as Facebook did starting with colleges built out the tech, worked out the kinks in their niche. And then as Slack grew and grew raised more VC and they could afford to tell more of a broader marketing story they moved out of that niche. So that really kind of encompasses the you know the six or seven points we feel like you can make that expansion out of a niche. Now the one thing that we will say is that you really have to prove it to yourself you cannot make these decisions without data without you know communicating with your team especially if you're a small startup. You can't just jump feet first into it without really thinking through that decision. Yeah that's a good point. I think the hardest person to convince to leave your niche if you're the decision maker in this scenario is probably going be yourself. You know there's a reason you're in the niche and that's why look for the data like you said. Talk to your team, get feedback, really prove it yourself, and get everybody on board that this is something you should be doing and taking on. Absolutely. So I think that's a good take away to leave it with you know we hope you'll let us know if you disagree with us or if there's a takeaway from this episode that you'll use to kind of guide your conversations and shape them throughout the week. Let us know via e-mail, social platforms, or you know all that's listed at blog.shape.io/podcasts. Find all the links there. And we are on Spotify now. Yeah. Thanks to transistor.fm our podcast hosting provider got us in their beta to get the podcast up on Spotify and we have gotten our first reviews on iTunes. Shout out to our two reviewers. Thanks guys. I don't know who you are. quesobob and Podaholic, but thank you for the kind words and the reviews so we can no longer say you can be the first review up there. But who's going to be the third? Aside from that too, Jon's got a really interesting episode coming up I'm going to step out of that one but you want to tell him a little bit about what's coming? Yup, next episode we'll be talking to Michael Mack he is the co-founder of the garden fresh group if you spend time in California. He was founder of the Sweet Tomatoes restaurant chain. He helped grow it from two to a hundred thirty five franchises over a couple states. He's got a really interesting story that I've heard him give some talks around town and I think he'll have a lot of great stuff for people to dig into so look for that next week. Sounds awesome. Thanks so much for listening guys and we'll talk to you next week. Over and out from Bend Oregon.